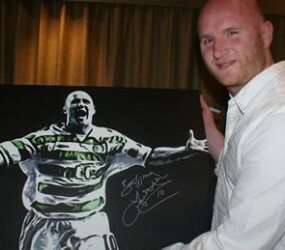 FORMER Celtic player, John Hartson, will appear at an exclusive football dinner with a difference at Arisaig Restaurant in Glasgow’s Merchant Square today (Thursday 7th June). Guests will hear John tell all about his glittering career with the Glasgow club, Arsenal and Wales – and his courageous journey back from the brink, after testicular cancer spread to his brain in a no-holds-barred interview with top sports journalist, Iain King. Then they’ll have the chance to put him on the spot by asking their own questions. John, who was diagnosed with cancer in July 2009, is a regular visitor to Glasgow and is looking forward to bringing his show to Arisaig Restaurant. He said: “It’s all about giving something back to the Celtic fans and all the people who supported me in the darkest days of my life. I wanted to do something for all the people who helped me through my illness. Guests will also have the chance to buy a signed copy of John’s book, Please Don’t Go, and win a specially-commissioned portrait of John, which will be signed with the personal message of their choice. Arisaig Restaurant is located within the stunning courtyard of the historic Merchant Square. Inspired by childhood holidays to the West Coast Village of the same name, the restaurant offers the best of Scottish cuisine in a relaxed atmosphere with friendly service. Located on Candleriggs at the heart of the Merchant City, Glasgow’s cultural, fashion and food quarter, Merchant Square offers an eclectic selection of restaurants and cafes. Once part of the old Glasgow Fruit Market, Merchant Square is imbued with the history of the area’s dominating Victorian architecture, although today this sense of history blends seamlessly with the distinctly cosmopolitan ambiance that pervades the surrounding cobbled streets that bring the outside in.